So, you have a Toyota Hilux. It was once a very reliable vehicle, and served you well. But now, for whatever reason, you want to sell it. Perhaps it has broken down forever, or perhaps it has gotten too old. Maybe you just need to sell it via a selling method that is incredibly fast. Who pays the most money and buys Toyota Hilux’s at the fastest speeds? Toyota Hilux Wreckers Brisbane team @ QLD Wreckers will buy that car off you, and they won’t just buy it fast. They will pay you the best cash deals as well. Up to $18’000 depending on what condition it is in! The Toyota Hilux has been consistently one of the most popular automobiles for folk to buy. And here at QLD Wreckers, we feel the same way. Maybe you have a scrap Hilux currently spending time on your lawn, completely useless and unable to be driven anywhere. Does it have cobwebs? It probably does. Whatever condition it is in, you should give us a bell our Rocklea scrap yards at QLD Wreckers. We will buy your Toyota Hilux whether it is in bad condition, great condition, or anything in between. Need a Quick Quote for Your Toyota? You can contact us over the phone or online. Dial 0416 615 100 or go to our website’s main page and fill out a form. We would love to assess all about your Toyota Hilux so we can ascertain using our knowledge in car valuation how much it is worth. Namely, what year it was manufactured in, and what condition it is in. We will then provide you with a free cash quote. There is no obligation for you to accept our cash offer. But if you do, we will come over and pay you instant cash in hand. Then we will remove your car from your property to bring it back to our scrap yard for recycling. We will not be reducing the price that the cost of pickup will be. This is not conducive to you getting the best possible cash deal from us. It will only end up in you having less cash at the end of the day. We are based in Rocklea but we have all the resources and manpower that help us to offer the free auto removal service across Queensland region (Gold Coast, Sunshine Coast, Toowoomba, Ipswitch, Logan, Beenleigh, Rockhamton, Rocklea, Warwick and Caboolture) of Australia. Same day pickup offered anywhere in Brisbane though. When we recycle a vehicle, we take the parts that are still in great condition, and we add them to our second hand parts stock. As we are always buying Toyota Hilux vehicles, we have a huge range of Toyota Hilux parts. They are in great condition and super affordable. Get in touch with Hilux Dismantlers for different parts and accessory options. And every single model not listed. We buy them all! 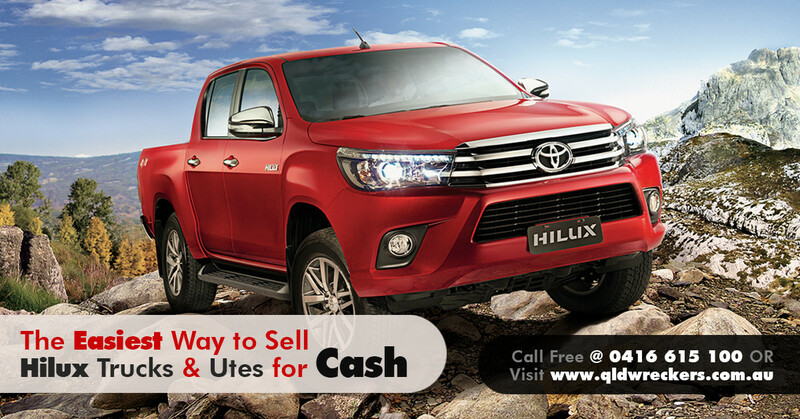 If you are holding any model of Hilux in any condition and wanting to scrap that for quick money, never hesitate to get a free quote from Toyota Hilux Wreckers Brisbane team @ Qld Wreckers. Good Luck!